The United Church of Christ historically has supported educational ministry in our churches, communities, and the nation. 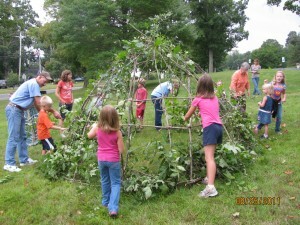 The Church of Christ in Granby takes Christian Education seriously while having lots of fun in the process. 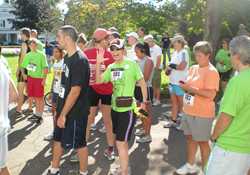 We offer a variety of programs for children, teens, and adults. Our Christian Education Committee works with the Christian Education Director, Tasondra Jardine, and the minister to plan interesting and enjoyable lessons. Children come to worship with their parents at 10:00. After children’s time in the worship service, they attend Sunday School classes in the Parish House next door. The following classes are held every Sunday except the first Sunday of the month: Pre-School through kindergarten, first through third grade, fourth through sixth grade. The first Sunday of the month is Communion Sunday. Children in Pre-School through second grade attend a one-room schoolhouse, which begins at 10:00 in the Parish House. 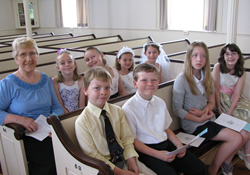 Older children attend church with their parents and participate in communion. Grades pre-school through grade six follow an age appropriate UCC curriculum, “Best of Whole People of God.” Lessons focus on how to live in the world as disciples of Jesus Christ. Classes use drama, arts and crafts, Bible games and skills, and cooking to help teach lessons. Children are also encouraged to help with mission, community service, and service to the church. Nursery Care is available for infants and children up to three years old in the nursery located in the Parish House. Children may be brought before church begins or if you prefer after children’s time in the service. Children are always welcome in church. The youth group program is for teens seventh grade and older and is held regularly on Sunday nights. The youth participate in mission, church and community service, and social activities. Bible discussions relate Christian values to every day life. Schedule and time varies depending on the activity. Please check with the church office to find out the youth group schedule. Confirmation classes are held every other year for young people eighth grade and older. 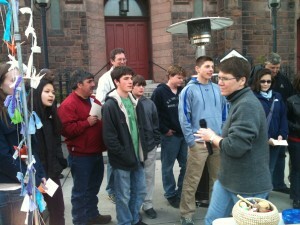 Young people learn what is unique about being a United Church of Christ member. We use the Bible and other resources to explore life issues, learn United Church of Christ heritage, and confirm their faith to live responsible Christian lives. The Christian Education Committee organizes programs throughout the year for families and children to participate in Christian fellowship. Activities include a Mardi Gras party, Family Fun night, Children’s Sunday and church picnic, in-gathering Sunday picnic, and more. Vacation Bible School program is held the third week in August. 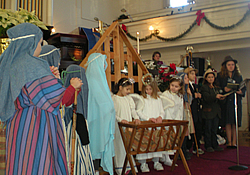 The children’s program includes crafts and learning activities centered on Christian themes.